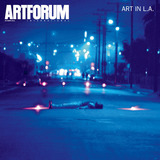 View of “Michal Rovner,” 2011. From left: Makom IV, 2011; Makom II, 2011. Douglas Gordon, Phantom, 2011, stage, screen, burnt piano, black piano, monitor, HD video. Installation view. Three different interventions made up this Scottish artist’s recent exhibition: some neon writing, a photographic installation, and a video installation. The neon piece, Unfinished, 2011, installed in the gallery entrance, carried the words JE SUIS LE NOMBRIL DU MONDE (I am the navel of the world). The neon was fractured right in the center, and fragments were visible on the floor. While it was turned on, the words were difficult to read, and thus it became a metaphor for an active subjectivity that is nevertheless conscious of its own limitations. 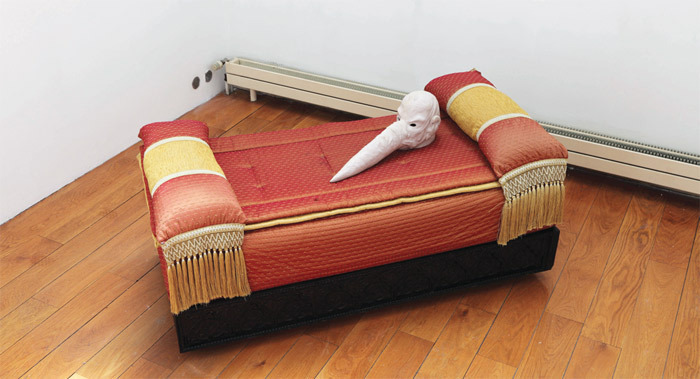 Denis Savary, Ostende, d’après James Ensor (Ostend, After James Ensor), 2011, elastomer mask, couch, overall 71 7/8 x 26 x 29 1/2".